210 pages | 10 B/W Illus. Gifted education has come to be regarded as a key national programme in many coutnries, and gifted education in science disciplines is now being recognised to be of major importance for economic and technological development. Despite these initiatives and developments internationally, there are very few discussions on gifted education in science drawing upon practices and experiences in different national contexts. 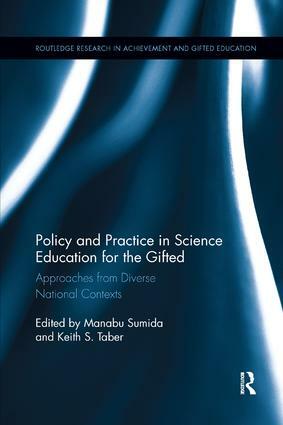 In support of an international dialogue between researchers and practitioners, often working within isolated traditions, this book offers information on key influential approaches to science education for gifted learners and surveys current policy and practice from a diverse range of educational contexts. The volume offers an informative introduction for those new to studying gifted science education, as well as supporting the development of the field by offering examples of critical thinking about key issues, and accounts of the influences at work within education systems and the practical complexities of providing science education for the gifted. The contributions draw upon a variety of research approaches to offer insights into the constraints and affordancxes of working within particular policy contexts, and the strengths and challenges inherent in different approaches to practice. This book will appeal to scholars, practitioners and policy makers who are in the field of gifted science education.